Miami Trace’s James Munro (left) faces off against Washington’s Jay Fettig during a Frontier Athletic Conference dual meet Thursday, Jan. 17, 2019 in the Panther Pit at Miami Trace High School. 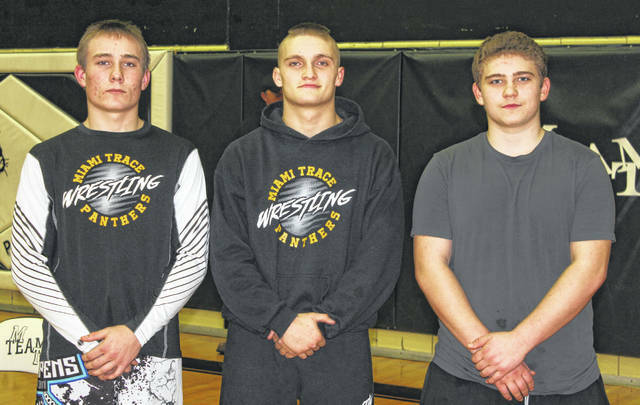 Miami Trace recognized its three senior wrestlers prior to a conference dual meet against the Washington Blue Lions Thursday, Jan. 17, 2019. (l-r); Dylan Arnold, James Munro and Alex Boldman. Washington’s Will Baughn, left, tries to keep his balance as Miami Trace’s Mcale Callahan works his leg during a match in the Panther Pit at Miami Trace High School Thursday, Jan. 17, 2019. The Miami Trace Panthers held the final dual wrestling meet in the Panther Pit Thursday night. It was rivalry night and the opponent was the Washington Blue Lions. It was also Senior Night as Miami Trace recognized its three senior wrestlers, Dylan Arnold, James Munro and Alex Boldman. The Panthers won the varsity match, 56-15 to complete the Frontier Athletic Conference dual meet portion of their schedule at 5-0. There is still the FAC tournament to come Saturday, Feb. 9 at Chillicothe High School. Miami Trace also won the middle school dual meet, which began the evening’s action, 54-33. The varsity match began at 195 pounds with Bryce Bennett of Miami Trace going against Collier Brown of Washington. Bennett won this match with a 3-2 decision. At heavyweight, Miami Trace’s Grant DeBruin won by pin over Mason Mustain in 4:38. At 106 pounds, Weston Melvin of Miami Trace pinned Bryce Warner in 1:16. Branton Dawes of Washington pinned Titus Lehr at 113 pounds in :15. At 120 pounds, Washington’s Collin George won a hard-fought match against Devin Seymour, 6-5. Storm Duffy (126) of Miami Trace won by pin over Austin Chamberlain in :21. At 132 pounds, Graham Carson of Miami Trace pinned Devin Slagle in 2:46. Kylan Knapp of Miami Trace (138) pinned Jordan Rohrer in :38. At 145 pounds, the Panthers’ Mcale Callahan defeated Will Baughn, 10-2. At 152 pounds, Jayden LeBeau of Miami Trace won an exciting 7-5 overtime decision against Kalub Wilkerson. James Munro (160) of Miami Trace pinned Jay Fettig in :26. Dylan Arnold won the 170-pound match, 18-6 over Dylan Moore of Washington. The match was concluded when Miami Trace’s Ashton Curtis won by forfeit at 182 pounds. A large crowd turned out on a wet night in Fayette County for the final dual in the Panther Pit. “We talked to our younger guys this week,” Miami Trace head coach Ben Fondale said. “They knew they had to be a part of the victory. They knew they had to come in, wrestle to get the pin, maximize points and wrestle with a lot of heart. “It’s hard to do that sometimes when you’re a younger guy,” Fondale said. “Because you’re often overpowered or out-matched. But, they wrestled with a lot of heart. There is still plenty of unfinished business for the Panthers. “At 113 pounds, Branton Dawes picked up a pin,” Washington head coach Louis Reid said. “Senior Collin George, I think this was his first win in this dual meet,” Reid said. “That was a big one for him. I was glad to see him pick up the win. He had to dig down. “At 220, Chase Sluder picked up a big pin,” Reid said. “We moved some people around. Chase is our back-up at 220. We put him there and he picked up a pin and that was huge. We moved Mason Mustain up to heavyweight. He’s a little on the light side. (Miami Trace) picked up a big pin there. Washington will next compete in the Hammer and Anvil tournament at Western Brown High School Saturday. Miami Trace will take part in the Hamilton Township Invitational Saturday. In the evening’s first match, Washington’s middle school team went up against the Panthers. The Panthers won the match, 54-33. At 80 pounds, Miami Trace’s J.J. Houser won by forfeit. At 86 pounds, Washington’s Ian Rousch defeated Corbin Melvin, 6-4. The next four weight classes all went to Miami Trace by forfeit: 92, Taevin Brown; 98, Asher LeBeau; 104, Riston LeBeau; 110, Aiden Johnson. At 116 pounds, Miami Trace’s Owen Howell defeated Cody Brown, 12-9. Aaron Little of Miami Trace beat Josiah Whitt at 122 pounds, 7-2. Vincent Munro of Miami Trace won by pin at 128 pounds over Zaigne Fettig. At 134 pounds, Miami Trace’s Thad Stuckey pinned Todd Erin. At 142 pounds, Washington’s Ethan Campbell pinned Keegan Williams. Washington’s Brady Rohrer picked up a win by forfeit at 150 pounds. At 160 pounds, Washington’s Connor Day pinned Stephen Lehr. Washington’s Charles Souther won by forfeit at 172 pounds. At 205 pounds, Washington’s Traver Crocker won by forfeit. At 245 pounds, Miami Trace’s Luke Hoppes pinned Nic Clouse.